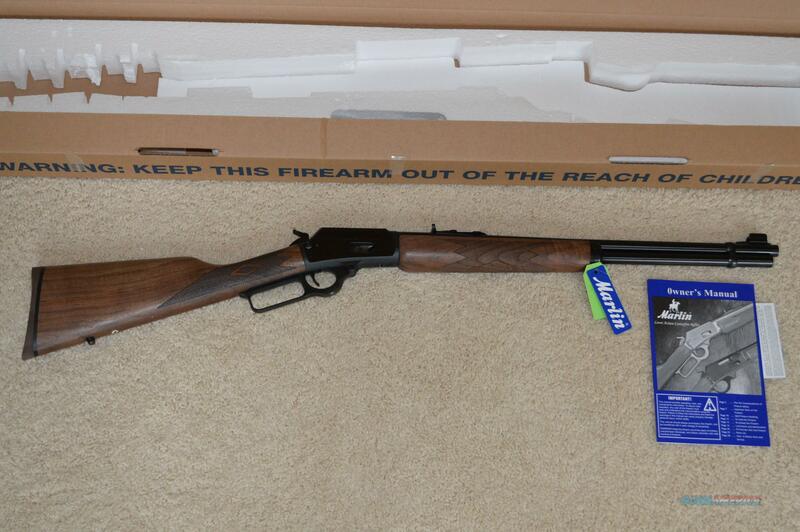 Description: NIB Marlin 1894 lever action rifle, 44 mag, 20" barrel. I am a FFL and if shipping item must ship to FFL for transfer. Item will ship upon receipt of payment AND receipt of file copy of transferring FFL's license. I ship the next business day AFTER receipt of payment and FFL's license. Handguns ship priority mail and long guns ship FedEx Ground. The quicker you pay and get your FFL to send their license, the quicker you will receive item. I CAN NOT SHIP UNTIL I RECEIVE YOUR FFL'S LICENSE! Visa, MC, Discover, Amex are accepted as well as postal money order. Price is for cash/certified funds payment. If paying with credit card add 3% to the total price including shipping. Item will ship insured and tracking info will be provided upon payment receipt and receipt of receiving FFL's license. Texas buyer's must pay sales tax on this item. PAYMENT IS EXPECTED WITHIN 5 DAYS OF PURCHASE OR ITEM WILL BE RE-LISTED AND NON-PAYMENT STRIKE ISSUED. If you are mailing payment please provide valid tracking number so that I know payment is en-route or I will re-list item after 5 days. Sorry to be so strict but 1 out of 4 transactions currently ends in a non paying buyer. It is buyer's responsibility to know if an item is legal in their area or not. LOCAL PICKUP OF PURCHASES IS AVAILABLE BY APPOINTMENT ONLY. No sales to California due to prop 65. This includes firearms, ammo and accessories. All firearms listed are new unless otherwise specified and are covered by manufacturer's warranty. Once a firearm has been transferred to customer, any issues must be directed to the manufacturer. TXSporting is not a warranty repair center. If a firearm is returned by the transfer FFL due to NICs decline or customer refusing shipment, purchase will be refunded minus shipping both ways and a 20% restock fee. If item arrives at FFL damaged, buyer must contact TXSporting prior to completing transfer to arrange for return of item and refund. No refunds once a firearm transfer has been completed.